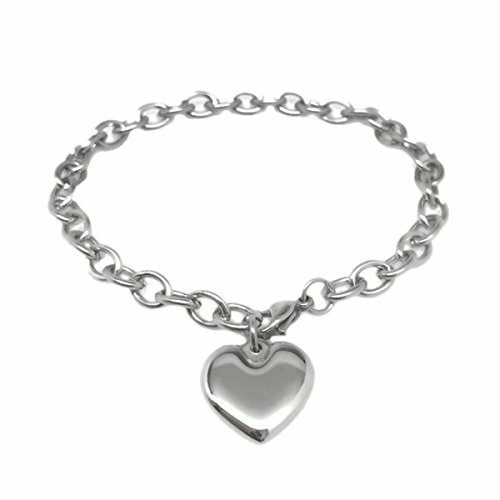 You will love this 1/4 inch wide polished mirror finish heart bracelet. Wear as is or add your own charms. It makes a beautiful gift for yourself or the one you love and is one of those jewelry pieces that can be worn all the time. Since it is 100% stainless steel, you don't have to worry about getting it wet or about it turning your wrists green. You never have to take it off and it will always look stunning. THE BENEFITS OF STAINLESS STEEL Stainless steel jewelry is rust-resistant and durable. Unlike silver, it will never tarnish and it is not susceptible to scratches, dings or dents. Stainless is also a great alternative for people that have skin reactions with other types of metals. If you have any questions about this product by Loralyn Designs, contact us by completing and submitting the form below. If you are looking for a specif part number, please include it with your message. SilberDream Charms 925 Sterling Silver Bracelet, 6.7"